What does McLaren do after the Indy 500? A lot of people scoffed at the appointment of Zak Brown to replace Ron Dennis as McLaren team boss. What does a marketing guy know about F1? was a common criticism. After a dismal start to the 2017 F1 season and Honda seemingly further behind than ever, those same critics smelled blood in the water. Somewhat fittingly Brown’s background as a motor sport marketing man has turned out to be a trump card. The marketing coup that is Fernando Alonso’s bid to win the 101st Indianapolis 500 has skilfully directed attention away from their F1 troubles. With the partnership under serious strain since the disastrous Barcelona pre-season test, a little less spotlight and media probing is a welcome relief. Brown has been taking a similarly proactive approach to deflecting attention with announcement recently of McLaren’s first foray in to the world of e-sports. Both represent a slick act of marketing ‘sleight of hand’ albeit with a limited shelf-life. The question is of course what happens after the 2017 Indy 500? What can Brown do to give McLaren’s investors, last few remaining sponsors, drivers and fans something to be hopeful about? Rookie Indy 500 win for Alonso? A rookie win for Alonso this month would give Brown about 500 miles worth of marketing mileage. Irrespective of McLaren’s (likely) continued F1 woes, for several months Alonso’s victory could keep the positive headlines flowing for the McLaren brand. Which is exactly what Zac Brown needs and wants in his quest to attract sponsors and investors back to McLaren for 2018. More likely is a strong but ultimately winless performance for Alonso. Plaudits and positive media coverage will run for several weeks but by the time the F1 circus reaches Baku at the end of June, the spotlight will be back on F1. So what comes next? Honda get their act together? The best option would be an upturn in performance from Honda. Rumours swirl that Mercedes are on the brink of providing consultancy assistance to Honda. Furthermore engine building legends Illmor are thought to already been advising Honda’s F1 project. Honda have got their act together in IndyCar. Can they do the same in F1? The likely pace of development however is what will stop this being a big step forward for McLaren. Significant power and reliability gains will only bring the project back in to contention at the fringes of the top 10. The year 3 objective of race wins is dead in the water and Brown will have trouble ‘spinning’ that to positive effect. It is questionable what good that would do (for both parties) barring a very temporary feel-good factor. Alonso’s career decisions have long been called in to question and the disaster that is McLaren Honda mark 2 offers yet more evidence. His commitment to McLaren will likely be seen as nostalgic, ill-advised or simply the result of limited alternative options. Brown’s marketing nous might be able to do something with it but this is not a season-salvaging option. Rumours were circulating last month that McLaren had approached Mercedes about an engine supply deal. Opinion was divided on the motivation: some suggesting it was a stop-gap to allow Honda time to get their act together, others that it was a sign of impending divorce. F1 rumours tend to operate on the ‘no smoke without fire’ principle. Undoubtedly there was contact between McLaren/Honda and Mercedes but this is likely to have been in the context of the engine support mentioned earlier. Even though Honda are supplying Sauber next season, stepping away from F1 with McLaren temporarily is unlikely to accelerate their engine development. And McLaren – with precious few sponsors at present – cannot afford to drop the massive financial and in-kind investment from Honda. Even if Honda were to up their game rapidly, Alonso was to re-sign or McLaren were to confirm Mercedes engines for 2018 none of those options would shift the spotlight in the way the Indy 500 adventure has. 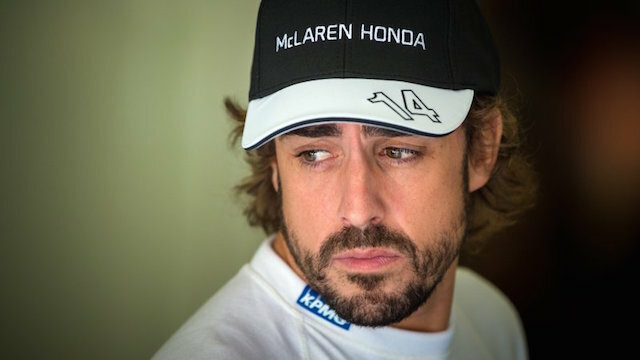 As has been the case since he rejoined McLaren, Alonso might need to be the saviour of the team once more. A win at Indianapolis seems likely to be the only thing that can salvage something from a terrible 2017 season.